Anyone who takes a lot of travel type photos is always happy to have geo-tagging done so they can tell exactly where a photo was taken. After a seven-day cruise, those ocean shots all look the same and who knows whether you were in the Caribbean or the Pacific. There are many GPS solutions on the market and each has their own positives and negatives. My recent test of the GeoPic II leads me to believe there are a lot more pluses to like about this unit The unit locks onto a GPS signal relatively quickly and lets you start shooting as soon as possible. According to their documentation, it takes 40 seconds to acquire a signal on a cold start, but I’ve had much quicker response on most occasions. Reacquiring a signal can be as quick as .1 seconds. 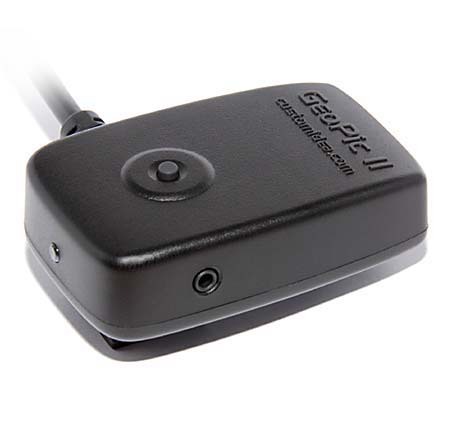 One of the major drawbacks to on-camera GPS units is the constant power drain. Some units suggest you set your camera’s automatic shut-off to 30 minutes so they can maintain their GPS connection. That really kills your battery life. With GeoPic II, that’s a concern you won’t have. It has a mode of operation that allows photos to be geotagged without contacting the satellites for each shot. There are actually three modes selectable by the user: continuous, low power and freeze. In low power and freeze modes, you’ll get almost the same number of shots as you would have had there not been a GPS unit attached to your camera. Continuous In this mode, your location is constantly monitored and sent to the camera from the satellites. A slow flashing red indicator means searching for signal and steady red means the signal is locked on. This mode takes the most power but is the most responsive when shooting and changing location frequently. I’d use this if I was on a tour bus or doing aerial photography from a helicopter. Just keep an eye on your battery as it’s going to lose power probably 3 times as fast. Low Power Here, the GPS location is sent to the camera if the green light is on and it will be sought if the green light is slowly flashing green. Pressing the shutter half-way down tells the unit to get a GPS location. When the light comes on and the unit beaps, the signal is locked in and you can take your picture. This is the most efficient outside mode, resulting in almost normal battery life. Freeze This is the mode to use if you are going to be taking photos inside where a signal can’t be read. Before you go in, set the GeoPic II in the blue Freeze mode and take a photo outside to lock in your location. The internal buffer maintains the location and each time the shutter is depressed while inside, the location is recorded on your photo. This is your most battery efficient operation, requiring almost no power. The GeoPic II works on all cameras with a 10-pin connector including Nikon D200, D300, D300S, D700, D2HS, D2X, D2xS, D3 and Fuji S5 Pro. The unit slips into the hot-shoe mount atop the camera and can also clip to your camera’s shoulder strap. The camera strap is the preferred location if you will be using either the cameras built-in flash (like the one on the D300) or an external flash like the SB800 or 900. Two cautions when using any hot shoe mounted GPS. The cord connecting the GPS unit to the 10-pin connector is just one more thing that’s liable to snag when hurriedly placing your camera in your camera bag. Also, if using it on a camera with a built-in flash, it will prevent the flash from automatically raising when needed. If there’s a case where you’ve set the camera to have the flash automatically pop up, you better to remember to mount the GeoPic II on your shoulder strap. Once your photos are embedded with the GPS metadata, you can access that information through a variety of programs like: Adobe Lightroom, Microsoft Expression Media, Nikon ViewNX, Apple "Preview" standard software (v5 and up) and "JetPhoto Studio" for Mac and PC. The GeoPic II can be ordered in the US through B&H Photo in NYC or in Europe at the Custom Ideas website.